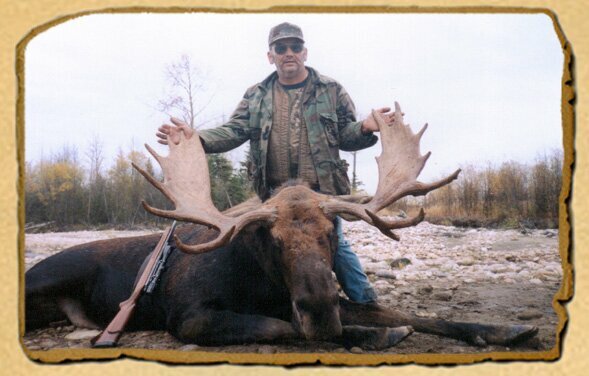 Shadow Creek Outfitters offers trophy Moose Hunts in northern Alberta for Bull Moose that can weigh over 1000 lbs, stand 7.5 ft at the shoulder and have antlers that measure as much as 6 ft from tip-to-tip. Our goal is to harvest bulls 40 inches or larger. 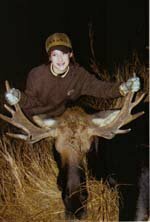 We run a very high success on this type of bull and encourage our hunters not to shoot anything less. A typical shot is around 100 yards, and can be as close as 10 yards, which is ideal for bow hunting. Every year we harvest a number of trophy bulls. Our Moose Hunt methods include a combination of calling, tree stands, and spot-and-stalk. There are natural mineral licks and watering holes in our hunting area which provide excellent opportunities to see trophy moose during your hunt. We offer both archery and rifle hunts. We take great pride in offering our hunters an opportunity at trophy bulls, and to offer an unequaled hunting experience. Our Moose Hunts start in late September and run until the end of November. Our Hunting area is WMU 511 (Rifle) and WMU 510 (Bow). This area has limited acces and great Moose habitat!! The base camp is generally a bush tent camp with bunk beds and wood stoves providing a clean dry setting for yourself and your gear. Bedding can be provided however most hunters like to bring their own sleeping bag (please clarify your needs with us before coming). 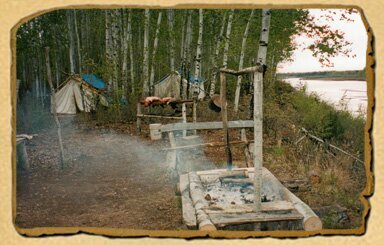 When ever more than two hunters are in camp (we generally have 4-6 hunters per camp) Shadow Creek has a cook on staff. We offer 7 or 10 day hunts from the end of September to the end of November. Both rifle and archery hunts are available. Combinations hunts (Moose, Mule Deer, and/or Whitetail Deer) are available. Please call for Specific Dates.